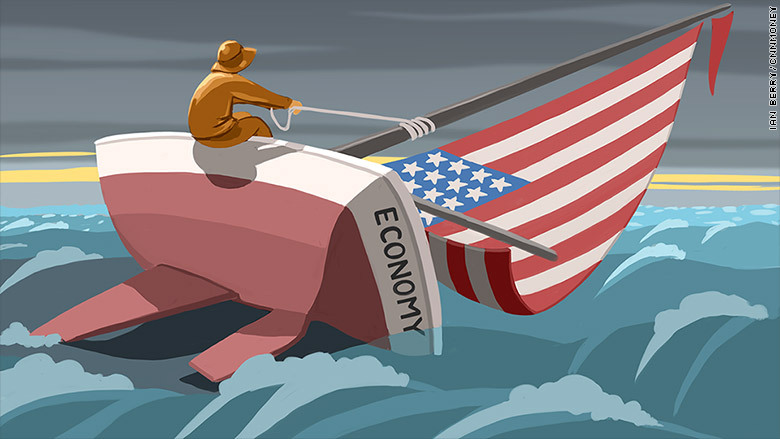 America's capsizing economy: Can it right the ship? America has had the wind knocked out of its sails this year. Volatile stock markets, weak economic growth and a hiring slowdown have created a perfect storm for nearly flat growth. The question is whether the U.S. economy and markets can right the ship in May and beyond. There's reason to believe they can start to this week. "We're in a slow growth economy," says Dorothy Weaver, former chair of the Miami Federal Reserve branch and CEO of Collins Capital. "I don't think we're heading for a capsized economy, but that doesn't mean we couldn't be hitting low winds and a doldrum." The economy's storm clouds: April was rough all around. It started with news that the economy only added 126,000 jobs in March, and previous months of job gains were revised down. Retail sales for March arrived in mid-April and they were sluggish. Then last week we learned that America's economic growth was next to nothing, a mere 0.2% in the first quarter. Maybe the worst news about the growth: Businesses haven't been investing in themselves this year. The newest projections for economic growth published by the Atlanta Fed show this spring could be disappointing too -- less than 1%. It all creates a gloomy picture. But this week's jobs report could be the first sign that the economy is righting the ship back to last year's strong performance. Many experts believe the March report was a fluke and that job growth will pick back up in April. "The labor market is good not great," says Scott Wren, senior global equity strategist at Wells Fargo Investment Institute. "It was an aberration what we saw [in March.]" Experts point out that the U.S. economy is still widely considered the best performer in the world. But that's also a problem for big multinational companies. Demand from China is dropping while Europe is just beginning to move in the right direction. That's causing American exports to go down. The strong U.S. dollar is putting an extra burden on emerging markets, another key trade group, too. All those global economic factors will continue to give stocks a rocky ride for the rest of spring, experts say. The market's gusty winds: Stocks haven't fared much better either. Overall earnings growth is down 3% so far this year, according to S&P Capital IQ. Last Thursday the Dow plunged 195 points and lost almost all its gains for the year. It regained steam Friday, but it appears the bull market has less room to run this year. Many forecast that the S&P 500 could finish the year in high single digits, or even 10%, but it's got a long way to go. The index -- which returned 11% to investors last year -- has only grown 2.4% this year. The Dow has shown tepid growth too, just around 1%. "The market is having a lot of difficulty finding its footing," says Kevin Mahn, chief investment officer at Hennion & Walsh Asset Management in New Jersey. "Part of it is this most recent volatility and concerns over economic growth." There is some good news. Barring the markets falling off a cliff, the bull market will become the third longest in history this week, according to Bespoke Investment Group. Sunnier skies ahead? : This year could still morph from The Perfect Storm to the Love Boat. The economy was even worse a year ago and stocks weren't surging ahead yet. Then both rallied. Last year was the best for job gains since 1999. The bull market charged ahead, eventually reaching its 6-year anniversary in March. Wren of Wells Fargo is optimistic that the economy and markets will catch their tailwinds later this year. "The bull market still has room to run," says Wren. "The economy has not stalled. We're going to continue to move forward at this modest pace."